DESCRIPTION: The previous owner of the Seabird did not have the gas tank bolted into the bottom of the deck. The results, not to mention the safety concerns, were that there is significant damage to the fiberglass. In this episode John repairs the damage and looks into if he can salvage the current tank for re-use. On the ACB he wants to increase the fuel capacity by changing out his current 2 tanks for a single larger one. Tune in to watch! John spends time with us discussing trim tabs… their functions and the various types we can choose from. He then talks about a new compass and where is the best place to install it on his Bertram Moppy. DESCRIPTION: On one of John’s project boats, the bow pulpit needs some reinforcement after a 600lb windlass was installed. Also John installs a special above deck live well that will keep live bait when he fishes… and be removable afterwards! DESCRIPTION: After John finds a trailer for his ACB boat, he turns to a highly rotted transom of the 1976 Seabird project boat. With this he learns how to repair the transom with fiberglass and a core product called divinycell. This episode deals with choosing and installing outriggers.. specifically on a 24′ Rampage. After the installation, John will teach you how to rig your outriggers and how to fish with them. In this episode John makes a set of coaming Bolsters for his Bertram Moppy so his passengers can have something to lean against. DESCRIPTION: On the 1978 Stamos Boat, John removes some of the rusted hardware and decides to get the original hardware re-chromed. He also installs some cockpit lights and hand rails. DESCRIPTION: In this half hour, John deals with a set of rusted out leaf springs on a small trailer as well as teaches us how to preserve the metals on our trailers for heavy usage. John has to address some ventilation issues on hid 1978 Stamos.. there is a mold problem that keeps coming up. Also he wants to build a new companionway door that matches the rest of the teak trim around the boat. DESCRIPTION: Now in this episode John discusses the various marine paints that are available to us boaters and then finally takes his Bertram Moppy in the paint she for a little rolling and tipping lesson. DESCRIPTION: In this special episode about our props, John teaches you how to, not only do repair our props by ourselves but gives us a guided tour on how the pros repair our propellers so we don’t have to buy new ones. Then its off to another factory and test site where John and company test out a new prop that has interchangeable blades. DESCRIPTION: In this first part in a series on the 1976 Seabird project boat, John removes the Sea Drive in order to make room for a more practical Bracketed outboard solution. DESCRIPTION: In this episode John concentrates his efforts in fixing a deck that has been compromised over time. Also John fixes some newly formed blisters on his Bertram Moppy paint job by using fiberglass cloth. DESCRIPTION: John has been making a custom tackle station out of teak wood for his Mako 22;, which will fit under the newly constructed transom gate. IN this half hour, he will continue to build upon it by constructing drawers that will house his tack on his fishing trips. Afterwards, it is time to look into refurbishing the windshield for the vessel. After building a custom tackle station, John looks to refurbish the windshield of his Mako 228 project boat. Learn how to take out the old pitted and oxidized look of your aluminum with such techniques like sand blasting and metal finishing. DESCRIPTION: Does your family enjoy Skiing, Knee-boarding, and wakeboarding? Well in this episode of Ship Shape TV, John shows us the different types of Flight Control towers; which aid the sportsman by making it easier to make higher jumps through the air. How do you stop the constant corrosion of your electronic terminal blocks? Well in this half hour John shows you how to keep these connections free and clean for full functionality. Also John will be installing a 12-volt plug so he can enjoy the various electronic accessories he takes aboard the craft… And lastly, a custom fillet table is built and John will teach you the proper way to filet a fish! Want to reel in that big fish from time to time and need some help with those long battles? 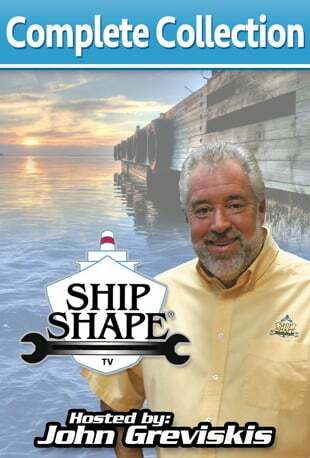 Well in this show John discusses fighting chairs and how they can complete your perfect fishing vessel. In this episode John and crew are repowering the Mako 228 project boat from a pair of Evinrude outboards to a single engine. This of course causes an issue with too many holes in the dash, which John will demonstrate how to resolve. Then lastly he will look into the various steering options for the craft and the new outboard. In an effort to get John’s ACB ready for a trip to the Bahamas, the time has come to choose and install the various marine electronics necessary…GPS, Chart Plotters, and fish finders are discussed and installed within the limited room of it’s dash. Its time to completely change the look and feel of the 1976 Seabird project boat in this part 1 of this series. Here John cuts out the inner liner of the craft in order to expose the original basic set-up to rebuild upon and, in doing so, exposes the rotted transom. John decides to replace the transom altogether. DESCRIPTION: After John completely replaces the Core of the transom for the Seabird project boat, it is time to put in an all new stringer system… for which he uses foam filled stringers with tied in fiberglass cloth.